... 1917, the 1st Pulitzers were awarded, and the all-male board gave a prize to women won in 1 of the 4 categories. The winning book in the Biography or Autobiography category was Julia Ward Howe (1916), written by Laura E. Richards (left) (credit) and Maude Howe Elliott assisted by Florence Howe Hall. All 3 were daughters of the subject of the 2-volume work, the slavery abolitionist and women's suffragist at right (credit) who, as we've posted: in 1862, wrote "The Battle Hymn of the Republic," an anthem that U.S. President Abraham Lincoln said precipitated the Civil War, then 8 years later wrote an antiwar poem that launched Mother's Day. 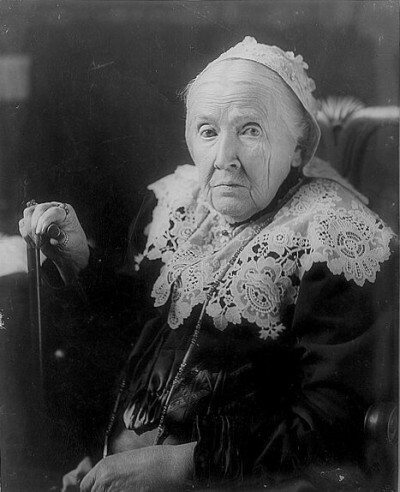 Ward Howe died at age 91 about 5 years before her daughters earned the prize.